A few days after my October 5 post, my computer crashed. It’s still not back to running the way I need to have it run, but there’s a Plan in the works to fix all that. While recovering from The Crash, we had our Big Party. 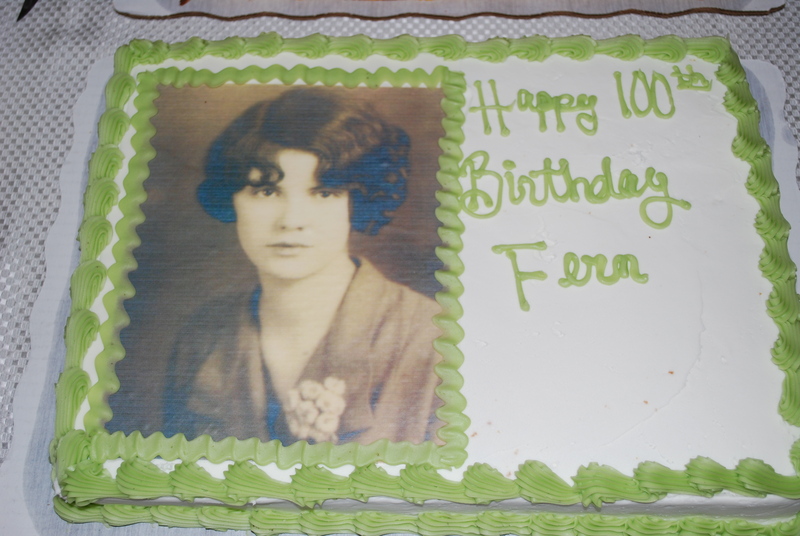 Grandma Powers turned 100 on December 5. We put Grandma's high school graduation picture on her birthday cake. On Sundays… remember that you are less likely to burn out as a parent if you replenish yourself by taking care of your own needs. Learn to recognize not only your physical needs (for exercise, rest and proper diet), but also your inner needs for solitude, prayer, time with friends, mental stimulation, spiritual growth and creative expression. Then build routine solutions for meeting these personal needs into the fabric of your week. On Mondays… keep in mind that children need warm approval as much as food, and they will be influenced all their lives by the people who praised them in childhood. So make sure that your children know you are their biggest fan. On Tuesdays… encourage silent reading. Some families give their school age children an early bedtime to allow them personal times for reading in bed. On Wednesdays… be aware that teaching children to be thankful begins with simple etiquette – learning to say “please” and “thank you,” and to express appreciation by writing thank you notes and making thank you phone calls. On Fridays… remember to encourage creativity by keeping a desk, table or other working surface available for projects. Then keep supplies (appropriate to your children’s ages) handy where they can get them. Children will be more apt to start projects if they don’t have to wait for someone to clear work space and get out supplies. On Saturdays… be sure to take hold of your family’s heritage of faith by learning the words to hymns and spiritual songs. Sing them through the day, at bedtime, and in the car. Thinking about the words will help you change your mental focus when you are worried or upset. You’ll feel better, and your family will benefit from the change in atmosphere. © Becky Cerling Powers 2001 Reprint with attribution only.